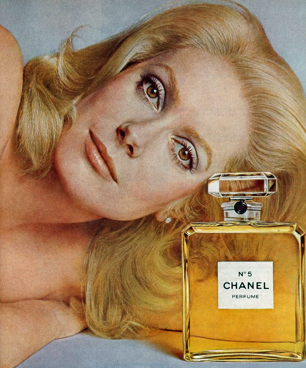 When I was a teenager, I didn't realize Catherine Deneuve was an actress. To me she was the fabulous model for Chanel No. 5. 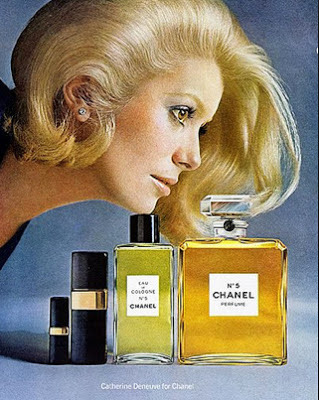 Catherine's face was plastered in every magazine and her nose was never more than a few inches away from a Chanel bottle. Who wouldn't want to sniff No. 5 all day? And.....get paid for it! Sometimes she had a feckin' big bottle of Chanel. They kept it away from her face though - she'd look silly. Deneuve sat on Louis Vuitton luggage a lot. I like that. I can't afford LV luggage and when I sit on other people's I've noticed they get really ticked. Catherine is now 70 years old and is still stunning. She's the epitome of elegance. 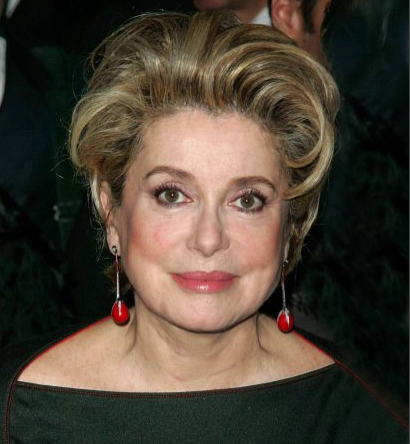 Deneuve is a longtime cigarette smoker and has expressed her frustration with the increasing bans on smoking. During a press conference held in Madrid , she was told to put out her cigarette and refused by saying she would pay the fine instead. "I think it is all very excessive", Deneuve told reporters. Ha ha ha. OK......I know it's not funny. Cigarettes are bad for you......blah blah blah.......still......she's Catherine Deneuve and she knows it. Isn't that interesting that all of those outlaws were fairly attractive...and you are right that Bonnie was very pretty. You would think for people to be so ugly on the inside as to murder people, that they might of been ugly on the outside as well. Very interesting. Wow..she does look amazing for 70. Surely that can't be without at least a little nip and tuck. If not she is the epitome of "aging gracefully." I have never smoked but I have to think a lot of smokers think that smoking bans have become excessive. As a non-smoker, it's hard to be too empathetic but still, I can see their frustration.